Covering local sports news in Tuam and the surrounding areas including Abbeyknockmoy, Claremorris, Corofin, Dunmore, Kilconly, Sylane, Killererin and Others. Connacht Cross Country Event, Juvenile Even Ages, Sligo Racecourse, Nov 4th 2018. It was a great day today in Sligo for the Club’s young Athletes who competed in the U12 Boys & Girls & also the U14 Boys Age Groups. A total of 26 Juvenile Athletic Clubs competed against each other, in a bid to represent their County & Connacht, in the upcoming Irish Life Health All Ireland Even Ages Cross Country Finals, being held on Nov 25th, in the National Sports Campus, Abbottstown, Dublin. It was a tough course for sure, with the hill to climb before the finish line and our Athletes gave it everything they had! All of the Coaches and parents are very proud of everybody’s efforts today. The U12 Girls had a total of 55 runners competing. Well done to all the girls who ran a super competitive race! Congratulations to the six girls who made up the Club’s Team Entry and have all qualified for the County Race Entry in the All Irelands – Myah, Eva, Danielle, Aoibhinn, Abbi & Saoirse. Four more top placing Athletes from other Galway Clubs will join them to make up the Galway County Team Entry. Out of the eight Galway Athletic Clubs that were competing, six girls qualified to make it on to the Connacht Team. Out of this six, four are from Tuam AC Juveniles. Huge congratulations to Myah, Eva, Danielle and Aoibhinn on their outstanding success on the day! The girls were delighted to go home with their Team & Connacht Medals. The U12 Boys had a total of 52 runners competing. lads across the line earned them the highest placed Team amongst the 8 Clubs competing! Five of the lads – Cian, Oisin, Darragh, Ross & Cian will go on to represent their County in the All Irelands. A total of ten boys make up the Galway County Team Entry, so to have five from the Club is just brilliant! The Connacht Team comprises a total of six boys, and the Club is very proud to have Cian, Oisin, Darragh & Ross take their well-earned four places! Smiles all round again as they all very proudly wore their Team & Connacht medals on their journeys home. The U14 Boys had a total of 37 runners competing. Both lads are strong Athletes and showed their determination by succeeding in qualifying for the Connacht Team! They will be joined by four other Athletes in their Age Category to compete in the All Irelands. The Club wish to thank all of the kids who competed today, for their commitment and hard work which has earned them great achievements, they should all be very proud of themselves. Thanks to all of the parents, families & Coaches who were all present today to support the kids. We look forward to Nov 25th in Abbotstown. Details of the Event will be shared as soon as we have them. Thank you. The fundraising committee which has been formed to fundraise for the upcoming clubhouse development, hold their next open meeting on Thursday 8th November at 8.30. We would welcome new faces or members who may have any ideas or suggestions to come along on the night to support this project. Dunmore MacHales GAA & LGFA will run an information session on college applications in Ireland & abroad on Wednesday 14th November @ 7.30pm in the enterprise centre. The talk will be hosted by ladies club secretary John Coyle who is a careers guidance teacher and it is open to all 5th year and leaving cert students & parents. It will be centered around student options after the leaving certificate including grants and scholarships. All are welcome & there is no charge for this event. Thanks to everyone who supported our bingo last Sunday afternoon. Thanks to Marie Howley for calling the numbers & to all members of Dunmore community centre committee for supporting the club with this. Thanks to people who gave some fantastic spot prizes for the raffle also. On Saturday our U16 ladies hosted Westport in an end of season friendly. Well done to the Dunmore ladies. It finished Dunmore 4g 13 to Westport 3g 12. Thanks to the organisers & to everyone who donated for the post-match refreshments. Cash for clobber collection continues at the dressing rooms. Please donate unwanted clothing to raise much needed funds for the ladies club. Bags can be left at the GAA pitch. No duvets please. €2 per line or 3 for €5. Online options available. Numbers 30th Oct: 5, 12, 14 and 24. Club members draw for €700 won by John & Louise Treacy, Laragh. Congratulations to Declan Molloy on his Nicky Rackard All Star with Leitrim last Friday night. Great achievement. Abbeyknockmoy Hurling Club in association with Ulster football proudly present a boxing exhibition night on Friday 28th December at 7:30pm in the Abbey Inn. The boxers comprise some of our senior and junior players and are being put through their paces as we speak. Drug testers will be visiting each fighter and will give two months’ notice in the interests of fairness. We are still finalising the amount of bouts on the night but you can expect between 5 and 10 fights. This promises to be a great night’s entertainment and we hope you can call down to see athletes in prime condition test their skills against one another. Spot prizes and raffle on the night. We could have had the fight night on Boxing day but you would have been blown away with the puns. The 28th was a fair call then. Tickets cost just €10 from any club member or at the door. Hopefully you can go and sample the unique atmosphere in the Abbey Inn. We will be keeping our social media pages updated on this the next few weeks. Plenty of news about the fighters will be leaked to the media also. Last weekend proved to be one of the greatest ever for Corofin GAA Club. On Sunday we completed a six in a row of Senior County Championships. On Saturday we won the Junior Championship and were promoted to Intermediate for 2019 and on Friday night Ian Burke won his first All Star, while his Cousin Daithí Burke picked up his fourth hurling All Star. Congratulations to everyone involved in these achievements. The Senior Championship County Final, played in Pearse Stadium on Sunday, ended in a victory for Corofin on a scoreline of Corofin 1-8 to Mountbellew-Moylough 0-5. The goal was scored by Dylan Wall in the first half and Corofin went in at half time leading 1-4 to 0-4. This was a hard-working display by our team, with Gary Sice being awarded the man of the match, Kieran Fitzgerald winning his 13th senior championship and joint captains Micheál Lundy and Ciaran McGrath bringing the Frank Fox trophy back to the parish for another year. Well done to all the players and to the management team led by Kevin O’Brien. The team will play Clann na nGael of Roscommon in the Connacht Semi Final in Dr Hyde Park on Sunday with throw in at 1.30 pm. We send best wishes to the team as they play their fourth game in four weeks. Our junior team had an excellent over An Fhairche – Clonbur in the replayed County Junior final, played in Tuam Stadium on Saturday. The final score was Corofin 2-17 to An Fhairche – Clonbur 2-8. The Corofin goals were scored by Justin Burke (1st half) and Conor Newell (2nd half). Corofin went in at half time leading by 1-6 to 1-4. Man of the match was Kevin Murphy, while Justin Burke scored 1-6. The team was captained by Alan Burke, an All-Ireland Club winner in 2015. Well done to the team and manager Ger Keane and his management team. No winner of lotto jackpot and no match 3. Numbers drawn 6, 9, 27, 32. Seller’s prize Brian Loughlin. Next week’s jackpot is €8,900 and draw in Club Office. The Burke family with All-Star winning cousins Ian (football) and Daithi (hurling). 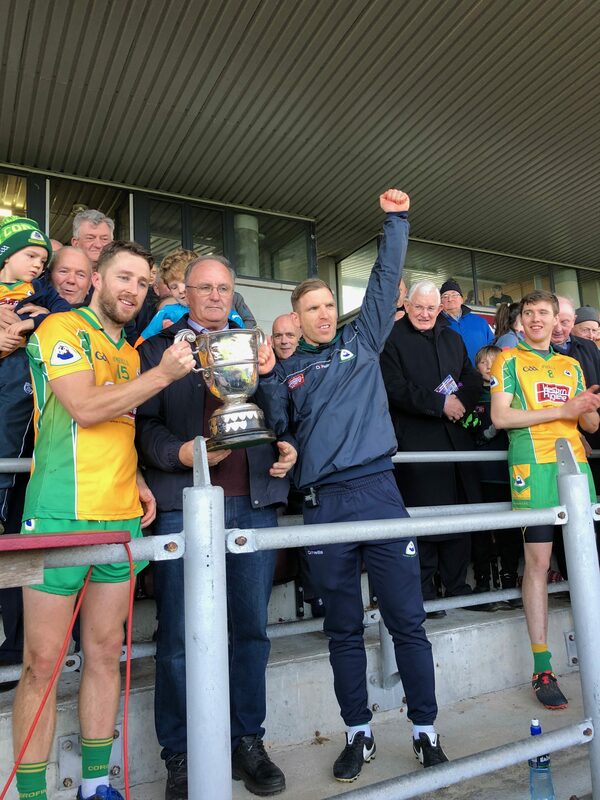 Alan Burke – Captain of the Corofin Junior team accepts the cup from Kevin Clancy, football board chairman. Man of the match in Junior game, Kevin Murphy & Senior captain Micheál Lundy with the County Trophies. Man of the match in the county final, Gary Sice receives his award from Paul Gill of Sponsors, Claregalway Hotel. Micheál Lundy, joint captain, accepts the Frank Fox Cup from Kevin Clancy along with joint captain, Ciaran McGrath. Details of upcoming and recent events will be online at 5pm every Tuesday. 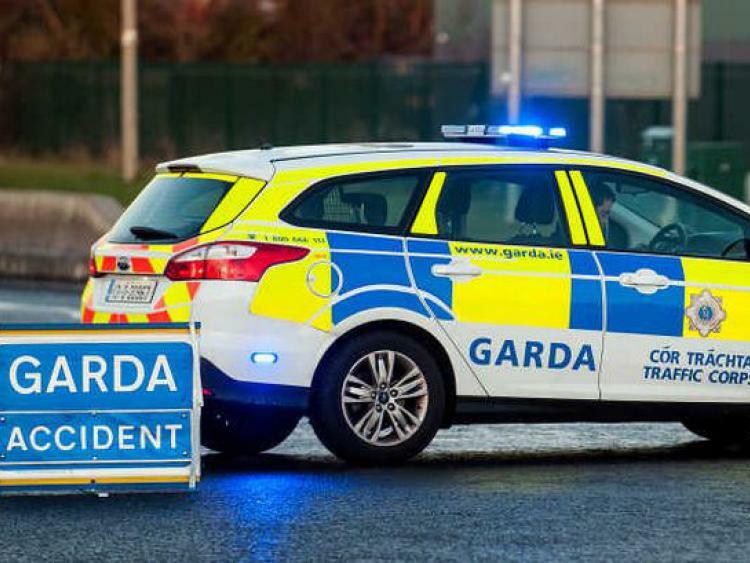 If your club or society has any information you want to share, please contact sport@www.galwaydaily.com with news/results/reports/events/pictures etc. You name it, we want it! And anything received before 10pm the previous Monday night will be included.